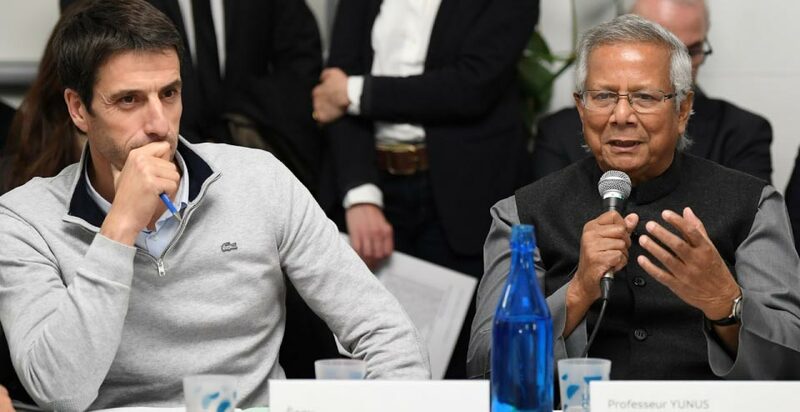 [Impact 2024] Professor Yunus co-leads the platform first strategic committee meeting. The first meeting of the Impact 2024 platform for Inclusive and Solidary Games took place last November 19th, 2018 in Paris. It is by Tony Estanguet’s side, head of Paris 2024, that Pr. Yunus led the launch meeting of the platform at Les Canaux. Gathered around strong convictions, local elected, unions, civil society and sports world representatives, they reaffirmed their will to create a precedent in the history of the Games regarding social inclusion. 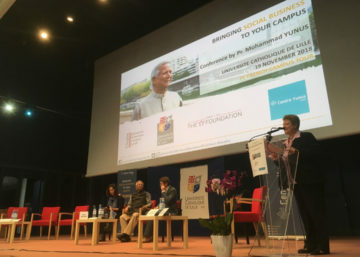 The Centre Yunus works closely with Paris 2024, Yunus Sports Hub and Les Canaux to set up this platform, in which the Nobel Peace Laureate is very involved. The objectives: make sure that on the about 250 000 jobs that could be created through the Games, 10% will be generated within enterprises providing jobs for the unemployed (insertion companies). Secondly, 25% of the turnover related to the Games should be made by local, small or social businesses. 30/01/2019 16/04/2019 [Feedback -YY Campus Tour #1 First steps] Lille Catholic University, SciencesPo, ESCP Europe: Pr. Yunus addresses the students. 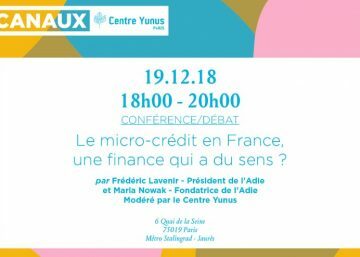 30/01/2019 07/02/2019 [Feedback – 2nd event Centre Yunus-Les Canaux] Micro-Credit, a finance that makes sense? 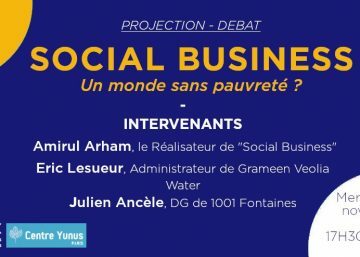 30/01/2019 07/02/2019 [Feedback – 1st event Centre Yunus-Les Canaux] Social Business and access to drinkable water: What solutions in developing countries?